Glass Balustrades Sydney. Enhance you view with glass balustrading. While glass balustrades can be more expensive than other materials (for example, timber) the cost is often recouped by the lack of maintenance and the increase in property value. We understand the importance of having a sustainable, long lasting glass balustrade design that that creates a sense of space and doesn’t obstruct your garden or interiors. Our experienced team happily offer free design advise that will assist you in choosing the most suitable product for the application. Expertly designed and professional installed, our glass balustrades provide complete safety for children without compromising on design. Our products are manufactured with compliance to Australian safety standards. Our frameless glass balustrades is made of 12mm toughened clear glass with rounded and polished edges. The spigots are anti-corrosion and have a mirrored finish that will ensure your glass balustrades retain a new look for years to come. Low maintenance and long lasting glass balustrades. Glass balustrades, even when installed outdoors, are very low maintenance and only require cleaning occasionally to maintain their clear appearance. Our stainless steel spigots also only require the occasional clean to keep shiny. For glass balustrade advice or installation quote contact us. We specialise in the installation of glass balustrading for external use. Our balustrades provide the safety and strength of a traditional fencing whilst retaining an unobstructed view and stylish, contemporary appearance that will increase the value of your property. 20+ years glass balustrade installation experience. Aqua Glass Fencing has over 20 years combined experience in the installation & maintenance of frameless glass balustrading. We are a locally owned and operated business with branches throughout Sydney. We are committed to keeping up with the latest industry safety standards, styles and glass balustrade designs with our priority being delivery a quality product for our clients that will stand the test of time. We offer installation advice and competitive pricing on all the glass fencing products. Our extensive range is ready in stock for fast delivery and installation. 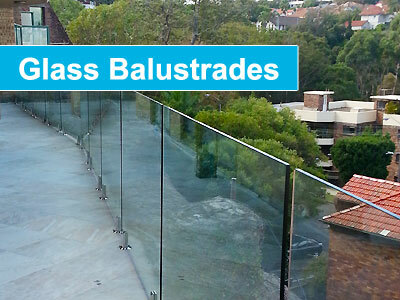 Do glass balustrades meet Australian standards for safety and Council requirements? Yes, all glass balustrades installed by Aqua Glass Fencing either meets or exceeds Australian standards. Are glass balustrade panels strong? Yes, our glass panels are 12mm thick and made from toughened glass. Glass balustrade panels are highly unlikely to break unless handled poorly. How high are glass balustrades? All our glass is 1200mm high which always allows us to meet the minimum height requirements for all pool fencing installations. Our balustrading is designed to suit all heights. Our framelss glass balustrades are made of 12mm thick toughened clear glass with rounded and polished edges. All our imported glass is tested to comply with Australian Standards. Can you cut balustrade glass to size? Yes, custom panels are not a problem. 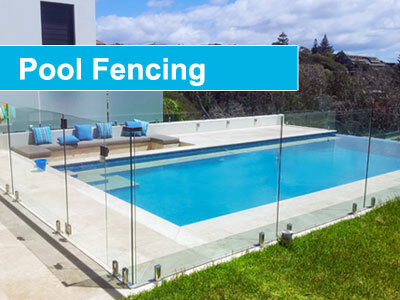 We can get them manufactured to virtually any shape and size which helps you to comply with pool fencing regulations. Who installs the glass balustrade? Our highly experienced glass fence installation professionals both supply and install your new fence or balustrade so you’re confident it is safe and will stand the test of time. Do glass balustrades require maintenance? Glass balustrades, when compared to other materials (such as timber) can be more expensive however the cost can often be recouped by the lack of maintenance required and the increase in value to your property value. Can glass gates be installed? Yes. All our glass gates are 1200mm high which always allows us to meet the minimum height requirements for all pool fencing installations. They are 8-10mm thick 12mm toughened clear glass with rounded and polished edges. We keep the gates thinner than the glass panels as thicker glass tends to sag after a few years. What fixtures and hardware do you use? All of our fixtures and hardware is manufactured from Duplex 2205 stainless steel. Duplex 2205 stainless steel is a better-quality finish than the standard 316 Marine Grade stainless steel. Duplex 2205 Heavy Duty Friction Square Core Drill Spigot. Friction Heavy Duty Square Deck Mount Spigot. Available in mirror, mat black or satin finish. Adjustable clamps, D clamps, corner clamps, straight clamps. Duplex 2205 stainless steel. Slim design for 10mm to 12mm glass with optional rubbers. 316 marine grade stainless steel capping to client requirements. We use Duplex 2205 soft self-closing hydraulic hinges. We use Duplex 2205 magnetic latches. 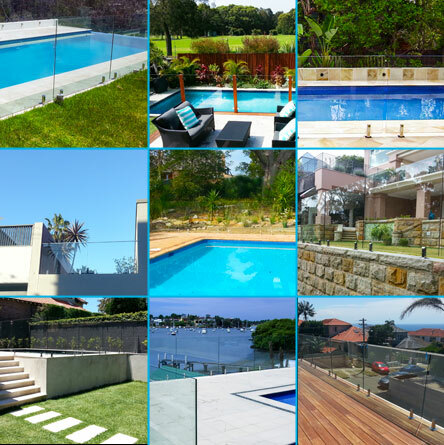 Aqua Glass Fencing and Balustrades specialise in frameless glass fencing and glass balustrades for all external areas of the home including pools, gardens and balconies, courtyards and so much more. Our products provide the safety and strength of a traditional fencing whilst retaining an unobstructed view and stylish, contemporary appearance that will increase the value of your property.